The democrats chose the Library of Congress for their reform agenda event. According to rules, the Library of Congress is off limits for political events… Oops! 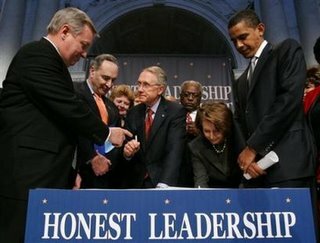 After signing the Democratic Ethics Reform Agenda, Harry Reid apologized to Republicans yesterday for his unethical behavior in attacking their unethical behavior. “I am writing to apologize for the tone of this document and the decision to single out individual senators for criticism in it,” Reid said of the 27-page statement sent by his communications office Tuesday. The release, titled, “Republicans cannot be trusted to end the culture of corruption,” triggered sharp complaints from GOP officials, who said it violated Senate decorum and brought campaign-style mudslinging into the Capitol. …The document was largely devoted to linking GOP senators to indicted lobbyist Jack Abramoff through campaign donations or legislative activities. But some senators with no ties to Abramoff were attacked for allegedly being “out of touch” after years of Republican control of Congress. Some purported offenses, most of them culled from newspaper articles, are years old. The document even attacked GOP Sen. George Allen’s days as Virginia governor for keeping a Confederate Flag, a pretty harsh statement for a party who claims a KKK Kleagle in their Senatorial Ranks. “It is like asking John Gotti to do what he can to clean up organized crime,” said Senator Harry Reid of Nevada, the Democratic leader. This was quite a bold move for the Party of Boss Tweed. This tax-payer funded memo then went on to attack 33 Senators in bullet point fashion even Sen. McCain who’s widely considered the the leading reformer in the Senate. These episodes bring up serious questions about the ethics of Senate Democrats.